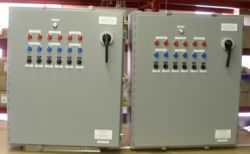 Hotfoil provides custom design and manufacturing of control panels for all Hotfoil heating systems. The objective is to provide Hofoil customers with a complete heating system solution. All Hotfoil designs are produced on AutoCAD and can be tailored for any requirement - from PLC control to basic on/off control. Hotfoil works closely with several leading control manufacturers, and is diligent to assure their quality, service, and availability are high. Hotfoil's experience in designing temperature control systems is very broad, and includes precipitator and baghouse heating, tank and vessel heating, and electric heat tracing. A simple project approach is always kept in mind - concept, requirements, design, fabricate, and test. On-site start-up services are available for all Hotfoil control panels and all equipment is 100% tested prior to leaving the factory.